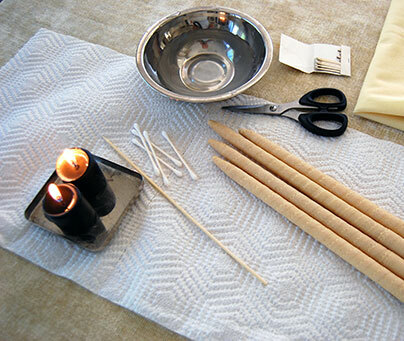 Ear Candling is an ancient 4,000 year old natural health therapy used around the world. At CIC, we use hollow candles made of 100% cotton fabric soaked in beeswax and essential oils. Once the candle is lit, a vacuum is created by the warmed air from the flame and colder air moving through its hollow center. The rising air through the column of the candle and gentle natural movement of the flame serve to gently massage the ear drum. The gentle suction safely and painlessly removes excessive wax and debris from the ear canal, relieves pressure from behind the eardrum, sharpens senses, alleviates sinus congestion, promotes relaxation, and balances energy. It is often described as a soothing, light sensation in the ear/head area and a general calming, relaxing effect. Disclaimer: CIC services are not intended to replace the relationship you have with your primary health care provider, and we do not give medical advice. It is important to always consult with your doctor if you have concerns prior to making changes in your current health care regimen. We encourage you to be open to new information on the effectiveness of Colon Hydrotherapy, as well as the critical role diet, exercise, stress management and positive surroundings play in your overall health and wellness. The information and services provided at Chicago Internal Cleansing is not used to prescribe, recommend, diagnose, treat or cure a health problem or a disease. We are not a substitute for medical care. If you have or suspect you may have a health problem, you should consult with your primary health care provider.